The Constitutional Court on Tuesday dismissed as "insufficient" a 16-page statement from President Park Geun-hye purporting to explain where she was during the 2014 ferry disaster. 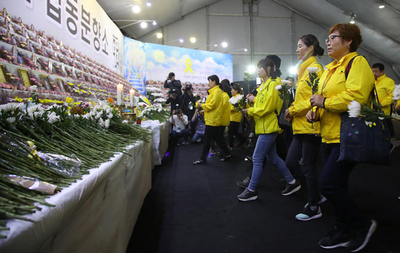 Park's lawyers submitted the document 19 days after the court asked her to detail her whereabouts during the notorious "missing seven hours" on April 16, 2014, when she was nowhere to be found as rescue efforts went badly awry and more than 300 young passengers and crew died. "We asked the president to reveal what she did on the day, but the document appears to be insufficient. It only includes what orders she gave and what reports she received," the court said. Her absence that day has become a hugely contentious question, even though it is a side issue in the crony scandal that has brought her down. The National Assembly, which acts as the plaintiff in the impeachment trial, also criticized the account saying it appears to have been "patched together." Instead it unveiled a 97-page document containing its views on the missing hours. The Constitutional Court conducts a hearing in President’s Park Geun-hye's impeachment trial on Tuesday. Park's account starts at 9:53 a.m., but lawmakers have focused their inquiry on what she was doing before 10 a.m. In the submission, she says she was first briefed by presidential aides at around 10 a.m., an hour after the ferry started to capsize off the southwest coast. She claims the briefing took place in her residence in the Cheong Wa Dae compound, where she had decided to remain because she had no official functions to attend and "was not feeling well." But the National Assembly has learned that the National Security Office at Cheong Wa Dae was told at 9:19 a.m. that the ferry had run aground with 474 people aboard and started sinking, and sent a text message to presidential officials five minutes later. Breaking news reports on TV also started at 9:19 a.m. 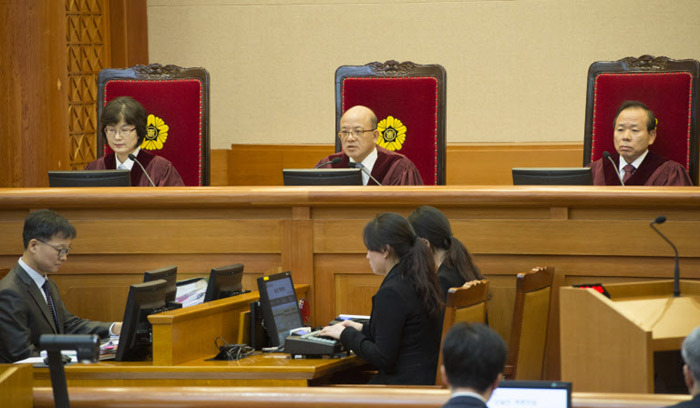 The National Assembly said, "It is clear that Park was unable to answer phone calls from the NSO chief or chief secretary from 9:30 a.m. until at least 10 a.m."
Constitutional Court judge Lee Jin-sung said, "Taking a look at the written answer, it is unclear when the president first learned of the sinking of the Sewol ferry. TV news began reporting the accident just after 9 a.m. so we need to know if she did not know about this before 10 a.m."
The submission purports to list the exact times Park was either briefed by Cheong Wa Dae officials or spoke with them over the phone. But Lee said, "What the Constitutional Court asked for was an explanation of the president's whereabouts based on her own memory. The report mainly lists what the president claims were reports she received and orders given on the day of the tragedy." Lee also pointed out that Park failed to submit records of what she claimed were numerous telephone calls with national security chief Kim Jang-soo. Some of the information looks contradictory. For example, Park's aides have claimed she was briefed in her residence by presidential secretaries An Bong-geun and Jeong Ho-seong. But in the written submission, the only people listed as entering the residence that day were a staff nurse who brought her mouthwash and her hairdresser. Also, the times of the briefings delivered by An and Jeong are listed as "that morning" or "after lunch," even though the timeframe of other events is listed in detail. The statement says since Park is single and has no family, her official residence serves as a "second office." She adds that former President Kim Dae-jung often worked from the residence due to his old age. But People's Party lawmaker Park Jie-won, who was chief secretary under Kim, said the former president "often came to his office to tend to matters even on holidays." The lawmaker accused Park of "insulting a former president by distorting the truth." Park's lawyers also claimed that former President Roh Moo-hyun was briefed at the residence when Kim Sun-il was beheaded by terrorists in Iraq in June 2004. But critics point out that Kim's body was found at 10:20 p.m. Korean time, so it would make sense that Roh had gone home by then and staff followed him. Park also claims that she took "all possible measures" to assist the rescue efforts and appears to blame others for any failings. "As she frequently received reports and gave orders for the rescue, the entire country was in chaos due to the inaccurate reports of relevant agencies and incorrect reports by the press," the lawyers said in the submission.